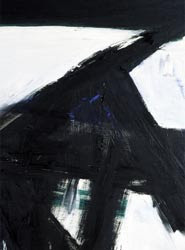 In the 1950s and '60s, fine artists Robert Motherwell, Robert Rauschenberg and Franz Kline dazzled art critics and museums around the world with their brilliant avant garde paintings. 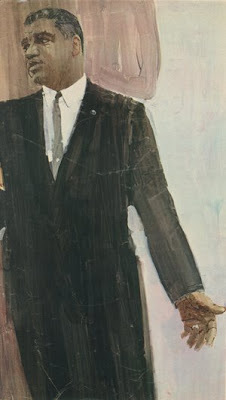 At the same time, another painter-- Bernie Fuchs-- dealt with the exact same aesthetic problems in a different forum. 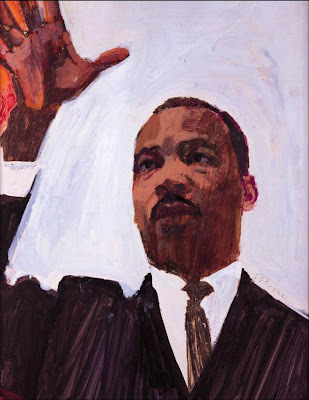 Like Motherwell, Rauschenberg and Kline, Fuchs rejected the realistic painting of his predecessors (such as Norman Rockwell) and focused on broader qualities of abstract design and composition. If we compare Fuchs' art with the work of the other three painters, applying the same standards, it is difficult to tell which painter is superior. Fuchs' compositions were equally bold and lovely. The colors and shapes were comparable. In fact, the only consistent difference between Fuchs and the three "fine" artists was the purpose for which the art was created. 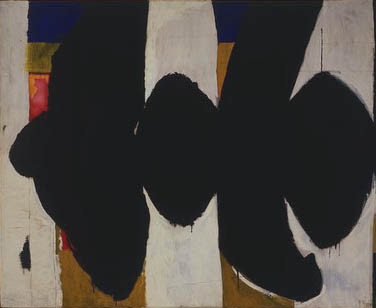 Motherwell, Rauschenberg and Kline created art for art's sake. Fuchs' art had a commercial function. He created art for a client's sake, for he is an illustrator. These two paintings by Fuchs (above) and Kline (below)share vigorous, caligraphic brush strokes, strong compositions against a painterly white background, and stark use of negative space. Both were highly innovative for their day. Can you tell which one belongs in a museum? ... accomplishes everything the Motherwell painting below it does. The big difference: the Fuchs painting also serves a function. 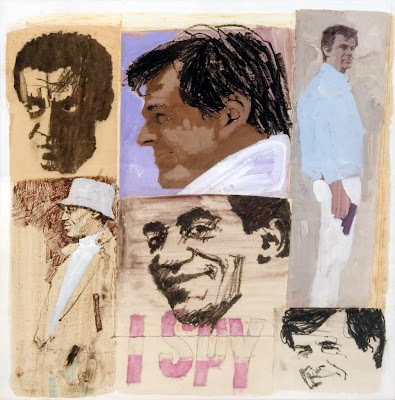 Beginning in the early 1960s, Fuchs began assembling "montage" pictures with multiple images, sometimes including photographs or "found" objects. In doing so, he rejected the orthodox notion that an illustration had to be a single image. 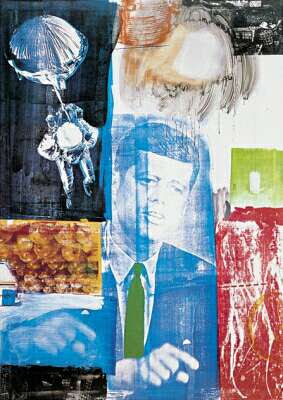 At exactly the same time, Rauschenberg wowed the art critics with his groundbreaking approach using montage images such as the one below. The Fuchs painting appeared on the cover of TV Guide. The Rauschenberg piece appeared in a museum. While Rauschenberg lacked some fundamental drawing skills, I think he was nevertheless able to make a very nice montage out of photographic images. At the risk of belaboring the obvious, if the "fine art" market had a higher ratio of intellectual integrity to bloviation and avarice, museums would display fewer pictures on the basis of pedigree and more pictures on the basis of the object itself. I worked as an illustrator in the Detroit area for 20 years, and eventually became a high school art teacher, teaching drawing, painting, and a bit of printmaking. I work at a charter school for the fine and performing arts, so it's a pretty cool gig. I'm now in my seventh year as an teacher, and received a masters degree in art education along the way. I recently decided to create a blog for my 2D Art students-- to serve as a resource, and also hopefully for a forum to discuss art related topics. Today I received an anonymous comment in which it was suggested that art that appears on CD covers (and, by implication, illustration in general) would be difficult to consider as "fine art". Of course, I had no problem with writing an effective rebuttal. Anyway, thinking more about this ever-popular topic for debate, I started fishing around online and discovered your excellent blog. I have read several of your posts, and you really hit the nail on the head, again and again. Your blog would be an excellent resource for my students-- I'm going to add it to my list of links.